Summer Office Hours begin on May 29! UCC congregations are involved with mission in many ways. In the United Church of Christ, we affirm that, although the congregation is the fundamental unit of mission, mission is not just local. We are connected to one another across boundaries of neighborhood, class, race, and national border. Our Church’s Wider Mission (OCWM) is the name we use to describe the work we do as the United Church of Christ beyond the local church–through our Conferences, national ministries, and UCC-related institutions. OCWM is also the name we give to the financial support given by UCC members and congregations that makes this broader mission possible. Congregations are central to the ability of The United Church of Christ to do mission in local communities, within the United States and internationally. As a congregation works in its own community, it is a representative of the entire denomination and embodies the UCC in that place. And when a congregation determines it’s giving to OCWM, there is a direct impact on levels of funding for the Conference and national ministries. Every local congregation has a responsibility to be aware of opportunities for local mission, and to be knowledgeable about the work underway by its own Conference and by the national ministries. Our Church’s Wider Mission has two parts: OCWM Basic Support and OCWM Special Support. Basic Support: OCWM Basic Support provides funding for the work of UCC Conferences and for the work of the UCC's national ministries. Each congregation decides how much of its members' financial support it will contribute to OCWM Basic Support. Congregations send their OCWM gifts to the Conference. Each Conference decides what percentage of those gifts to keep for the work of that particular Conference, and what percentage it will send to the national setting of the UCC. Some of the National Basic Support money is used for ministries to Conferences, local churches and members, as well as for ecumenical, prophetic and missionary ministries on behalf of the UCC. Contributions from individuals to their congregations comprise the funds from which OCWM Basic Support is given to the Conferences and national ministries. One Great Hour of Sharing: Giving Help, Hope and Life: Supports partners in more than 70 countries with ministries that fund development projects, feed the victims of famine, provide services for displaced people, and respond to natural disasters. These ministries are the responsibility of Wider Church Ministries, Global Sharing of Resources. Received annually on the fourth Sunday in Lent. Strengthen the Church: Faithfully Building the Body of Christ: Supports church growth and leadership development in the conferences and through the national offices of Local Church Ministries. Received annually on Pentecost Sunday. Neighbors in Need: Justice and Compassion Like a Mighty Stream: Supports ministries of justice and compassion throughout the United States including ministry carried out by the Council for American Indian Ministries (CAIM) and by the national offices of Justice and Witness Ministries. Received annually on World Communion Sunday, the first Sunday of October. The Christmas Fund: Remembering Those Who Serve Our Church: Provides financial aid to retired and active ministers, and their surviving spouses and children who face overwhelming financial demands. Received annually on the Sunday before Christmas. Our sympathies and prayers go out to the families of Dorothy Neuhaus and George Goeldi. Dorothy and George both passed away this past month. In the midst of our grieving, let us remember they have gone to be in glory with Jesus Christ our Lord and Savior. We are almost halfway through the Shared Ministry trial period. Please spend some time reflecting on how things are going, questions you may have, or ideas to make it better, and share those thoughts with me at church, phone or by email. You may also reach out to Ken Lisowe, Karen Cmejla or Pastor Mike. We will be meeting with St. John's to discuss how things are going on their end, as well. This is an important time in the church and we want to have your voices heard!! 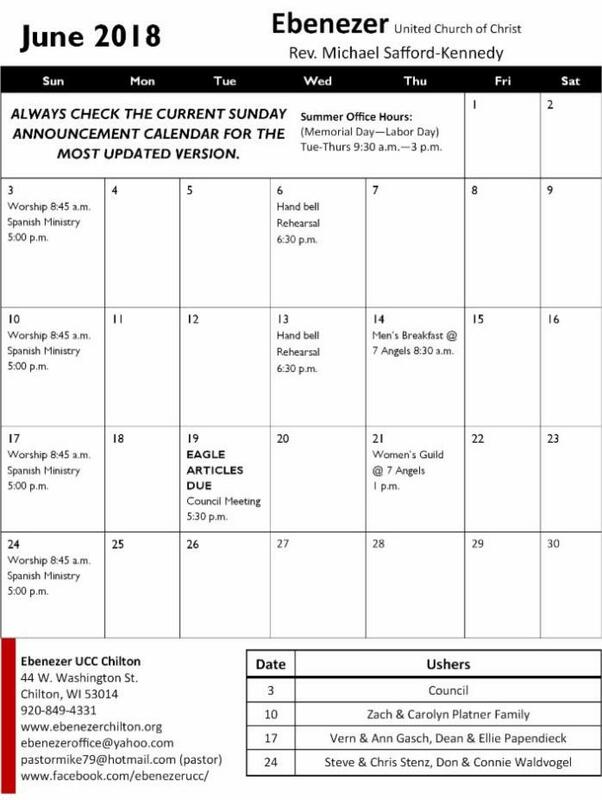 Below is the Summer Ushering Schedule; please note that the church office does not find a replacement, but we are happy to help you get in contact with possible subs! Please let the office know when any changes are made. 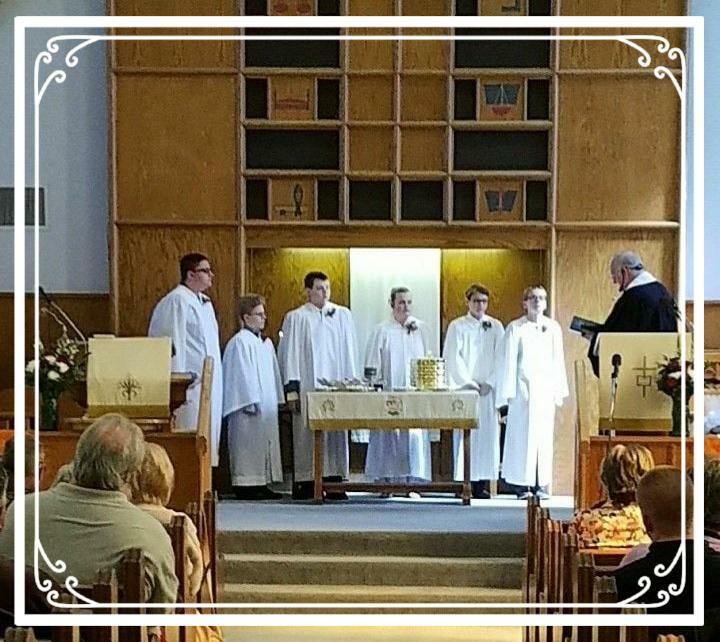 Congratulations to our Confirmands: Breanna Cook, Skyler Goerl, Pat Marx, Noah Brown, Teagan Sabish, and Bobby Van Beek. We are proud of your work and pray you will continue to grow your faith! 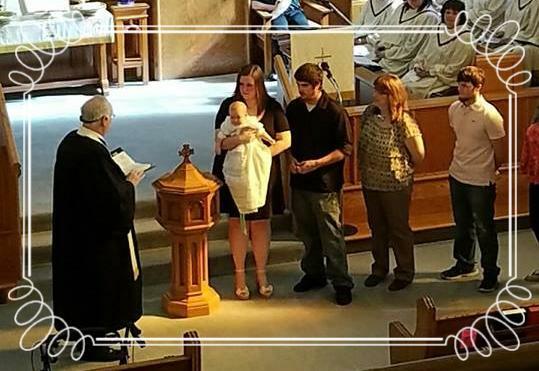 Rylee Jetzer was baptized on Sunday, April 29! Natalie Adamietz playing the piano selection, “Amazing Grace,” on May 13! Another Sunday School year is in the books as we said goodbye for the summer on May 13. The morning began with our final Children's Worship Sunday for this school year, and then we enjoyed a game of Bible Baseball, a review of many of the things we have learned since September. In keeping with the baseball theme, we enjoyed hot dogs (cocktail sized) and apple cider, and the winning team members all got Cracker Jacks! Second place players all got peanuts. Almost as good as being a real game, don't you think? We had selected the American Red Cross as our mission project this year because hurricanes Harvey and Irma had just hit days before our first week together, and we had talked about the impact that these storms had on the children in Houston and Florida. From the collections during our weekly offerings, we were able to send a check to the Red Cross in the amount of $450.00. We had 24 children enrolled in Sunday School; four of these students will be moving on to the confirmation program in the Fall. Thanks to our teachers: Kristi Schnell, Ann Gasch, Shirley Lisowe, and Krysta Roehrig, who was kind enough to fill in for Tiffany Porsche after the birth of baby Oliver. We're looking forward to a safe and enjoyable summer off, and will do it all over again beginning in the Fall! 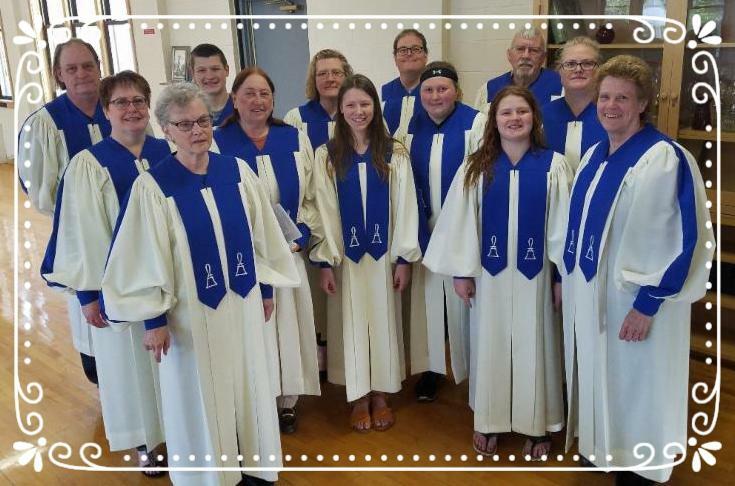 As Ebenezer Brass Handbell choir winds down for the summer, we extend a special thank you to all the ringers for their effort, time and diligence in providing special enrichment to the worship services this past year. THANK YOU (back row) Gary, Dale, Janel, Michael, Don, (front) Jill, Ann, Ruth, Claudia, Caitlynn, Meghan, Stephanie and Karen, (Lynn not pictured). We'll look forward to having you back in September! It is always a delight to have young people involved in worship. 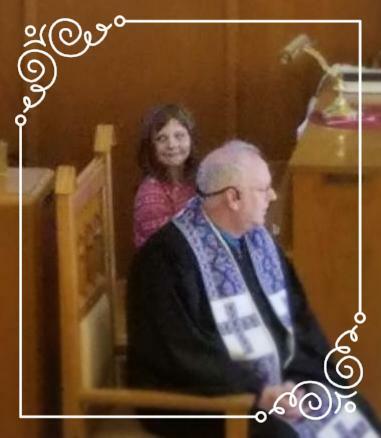 Thank you to Natalie Adamietz for the piano selection, “Amazing Grace,” as a tribute to Moms and part of Youth Sunday on May 13. Any other youth interested in playing an instrument for worship, please inform Pastor or Elaine . As has been done in the past, we’ll plan on doing sing-along's of favorite hymns before worship during July. On the last 2 Sundays in June, slips of paper will be available for you to list your favorite hymns and drop in the collection plate. Be thinking of some of your favorite hymns – they need not be in the hymnal, they can be old time favorites or contemporary, whatever moves you!!!! July 14 – 21, Claudia Brown and Karen Cmejla will be attending the Handbell Musicians of America National Seminar in Grand Rapids, Michigan. It is truly a fun/fact-filled event. They have pre-registered for some very interesting sessions. Claudia will be part of a distinctly teen session that will perform at 1:30 p.m. on Saturday, July 21. Hopefully, that will be taped so we can view it. They are sure to come back with lots of exciting ideas – good luck Claudia and Karen! Karen and Hannah Verrier attended the seminar in 2012 where they, along with 280 attendees, rang the National Anthem before a Brewer – Reds baseball game at Great American Ball Park in Cincinnati. It proved to be a memorable experience. This year’s seminar should offer more of the same kind of excitement! 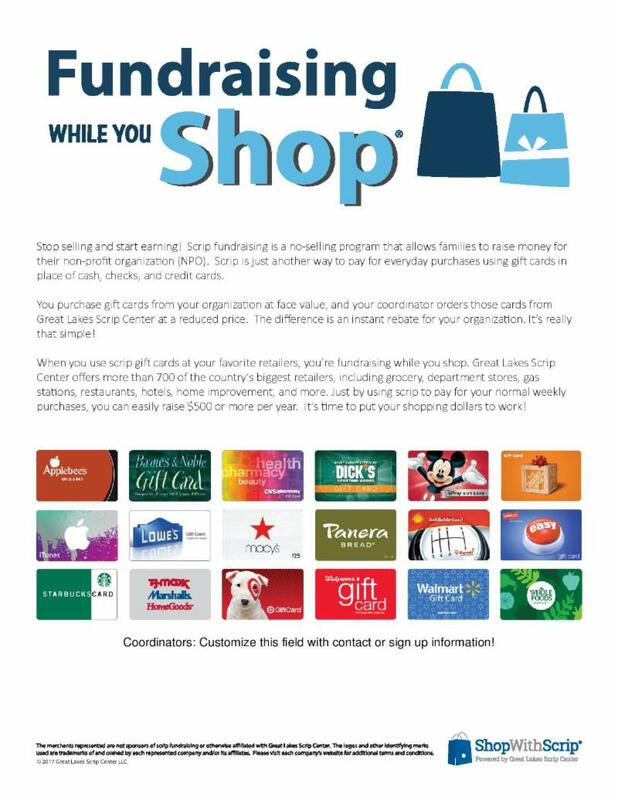 Ebenezer has purchased a software that will allow the office to better record member giving, keep an accurate directory, manage invoices, create an online calendar, and more! With this new software comes the ability for all EUCC members listed in the directory to update their personal (and family) profile AND view their giving statement at ANY time! If you have any troubles with this process, please contact Jackie . The meeting of the Ebenezer Church Council was called to order at 8:03 a.m. by Kelly Brown. 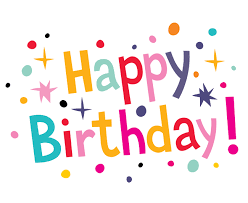 It was postponed for the service at 8:46 a.m. and resumed at 9:45 a.m.
Kelly Brown, Colleen Marx, Kari Meyers, Vern Gasch, Jamie Plate, Dale Hintz, and Pastor Mike. Absent: Andy Hofmeister. Approval of Minutes: The April 2018 meeting minutes were previously approved via email. Our April revenue was $13,959.71. Our April expenditures were $9,654.48. The Equity as of April 30 th was $86,819.12 Our balance as of April 30 th was $285,678.24. Our stocks went down to $29,311.41. Dale Hintz made a motion to accept April’s financial reports. Vern Gasch seconded. The motion carried. Dale Hintz made a motion to accept the May bill list. Vern Gasch seconded. The motion carried. Attendance each Sunday is an average of 91 persons. Giving is an average of $1,993/week. 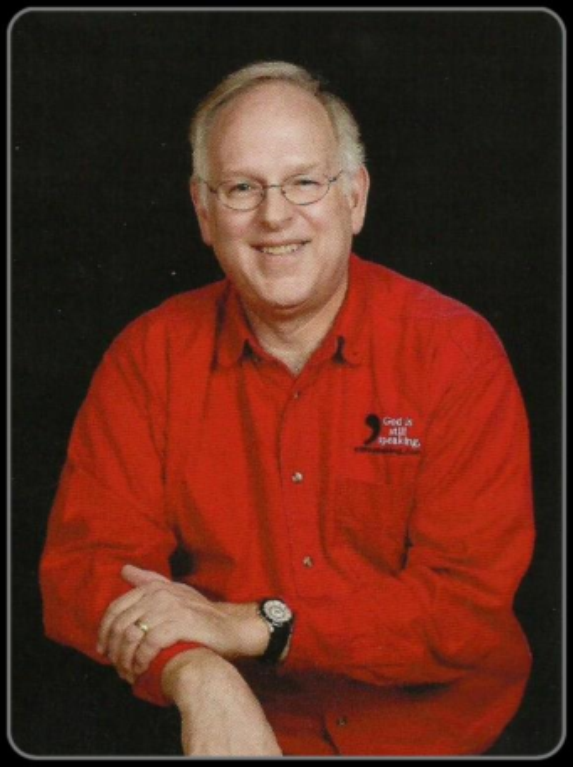 Pastor Mike will be on vacation May 30 - June 7. He will be at the annual conference meeting June 8 - June 10. Evangelism: Flower pots will be placed in the community. Property: Annual walk through of the parsonage will be in June. Church Security: No new news. Shared ministry: Ken Lisowe and Karen Cmejla have volunteered to be on the oversight committee. Please contact them or any council member with any questions or concerns. Property Purchase: Vern Gasch has contacted our attorney who contacted the seller. The seller has not accepted our offer. Our offer will not be changed. Negotiations have been suspended. Happy Hour Lease Renewal: The council has submitted the 2018 - 2019 lease for review and signature. Thank you to Ruth Aebischer for staffing the office while Jackie was on vacation. 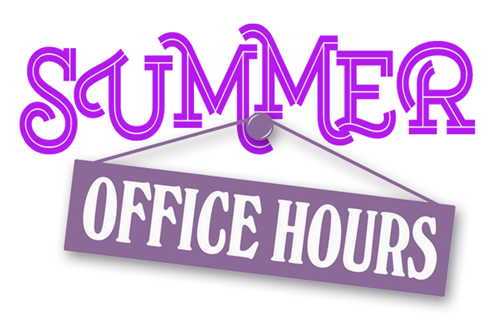 Summer Office Hours are Tuesday - Thursday 9:30 a.m. to 3:00 p.m. The NEA Division on Local Church Ministries Discernment survey will be completed and submitted. Adjournment: Kari Meyers made the motion to adjourn the meeting. Vern Gasch seconded. Meeting was adjourned at 10:10 a.m. Ever wondered what happens at EUCC during the week? Here's your chance to find out! 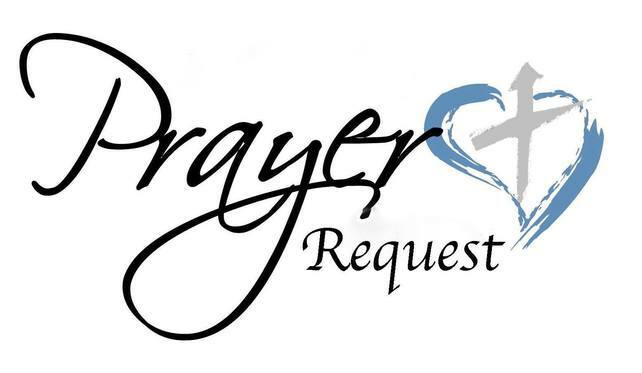 We are looking for someone to help in the church office greet visitors and answer the phone on Tuesday, July 3, from 10:00 a.m. - 3:00 p.m. If you are available to help out, please contact Jackie. 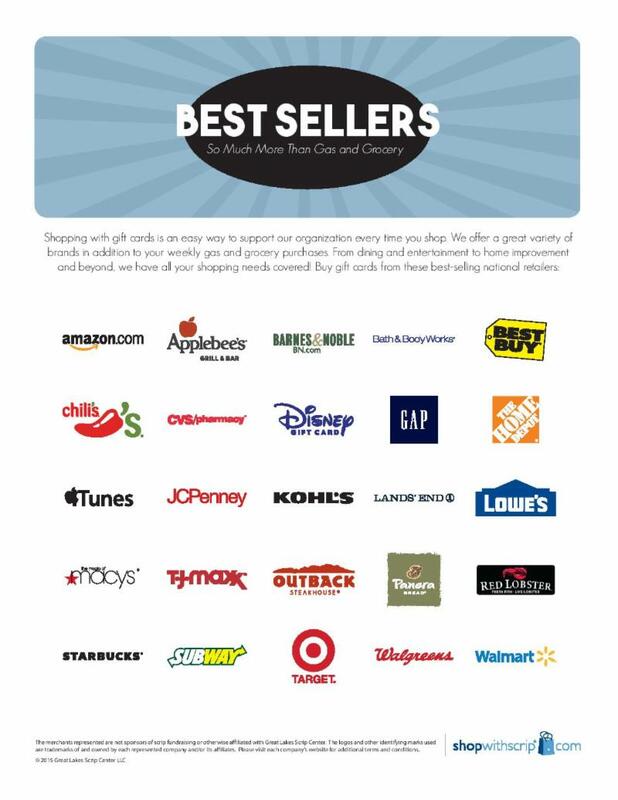 We appreciate your assistance!!!!! 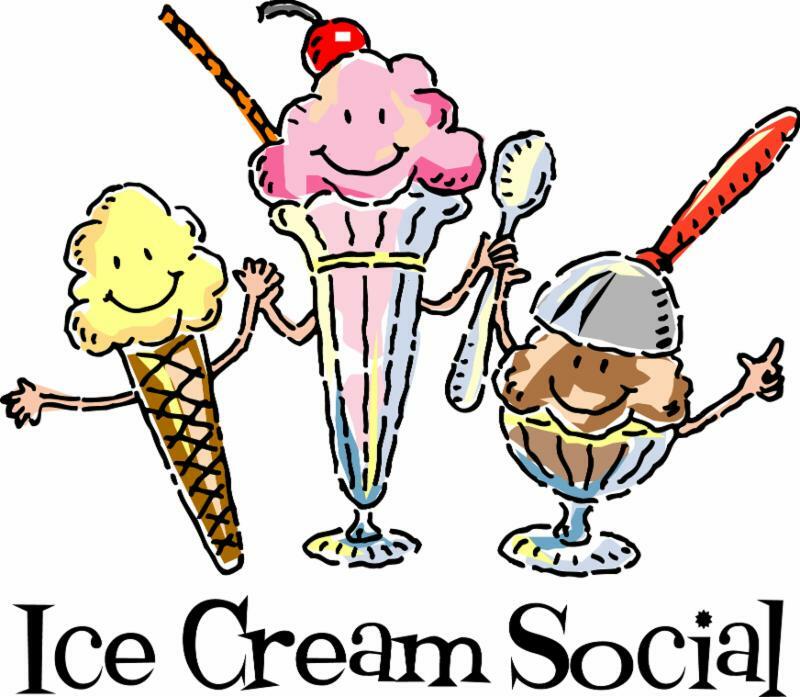 Mark your calendar for the Ice Cream Social Supper on Wednesday, July 11! The dining room will be open from 4:00 -7:00 p.m., and carry-out will be available from 4:00 -6:30 p.m. Stay tuned for more information!!!! Thank you to Tiffany Porsche for the “MoMs are the sweetest” treats on May 13 for Mothers’ Day! Congratulations to our graduating High School Seniors: Casey Stephenson, Cory Woelfel, and Dylan Tyson! Although the 'Passing of the Peace' is not currently in the bulletin, we encourage you to greet one another following worship! The Calumet County ADRC needs volunteers! See the press release or visit the link to see all the ways you can help! The May/June Upper Room devotional guide is available in the Narthex book rack. Help yourself! All unexpired, non-perishable food items are welcome back in the Blessing Box. You are invited to attend the Homeless Connections 28th Annual Garden Walk Tour on Saturday, July 14. Click here for details and tickets! From Tuesday, May 29 - Thursday, August 30, Jackie will be in the church office Tuesdays - Thursdays from 9:30 a.m. - 3:00 p.m.